A team of researchers with the Ulsan National Institute of Science and Technology in the Republic of Korea has developed a glucose monitoring contact lens that its makers claim is comfortable enough to wear. In their paper published on the open access site Science Advances, the group describes their contact lens and suggests it could be ready for commercial use within five years. Diabetes results in unmanageable glucose levels, requiring those who have the disease to monitor and adjust them with insulin or medicine. Monitoring, unfortunately, requires pricking a finger to retrieve a blood sample for testing, which most people do not like. For that reason, scientists seek another way. A new method employs a contact lens. Prior research has shown glucose levels in tears follows that of glucose levels in the blood in many respects. To date, there are no commercially available contact lens products because, as the researchers note, they are made of hard materials that are uncomfortable in the eye. They claim to have overcome that problem by breaking apart the pieces of their sensing device and encapsulating each in a soft polymer and then connecting them together in a flexible mesh. The polymer is the same type used in conventional contact lenses. The components of the device consist of a graphene-based sensor, a rectifier, LED display and a stretchable antenna. Power for the sensor is still external—it is held in the air a minimum of nine millimeters from the lens. The LED glows during normal conditions and turns off when high levels of glucose are detected. 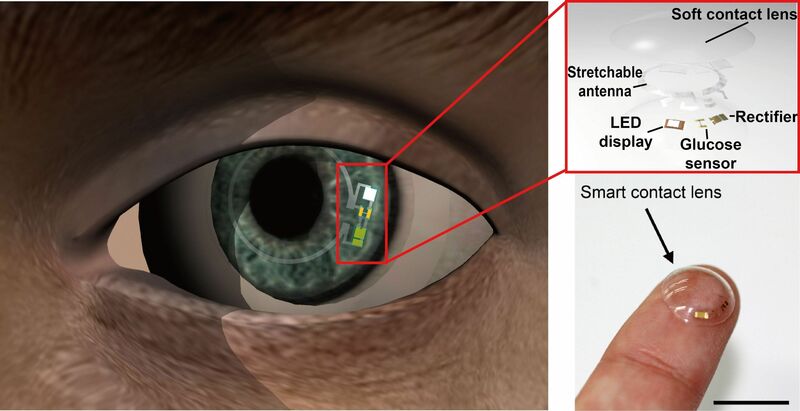 The flexibility of the lens and sensor components also allows for removal of the device in the same way as normal contact lenses—by grabbing and bending.